The lavishly colored Rainbow Eucalyptus (Eucalyptus deglupta) gets a “tip of the hat” for being the only indigenous eucalyptus found in the Northern Hemisphere. It originated in the regions of Mindanao, New Britain, New Guinea, Sulawesi and Seram but somehow found it’s way into the Hawaiian island chain over the last several centuries. The bark of the Painted Eucalyptus peels off each year, revealing a vibrant palate underneath. When wet, the colors become an almost unbelievable display of color… an electric rainbow. Many professional photographers love to photograph this species right after a good rain, just as the sun is breaking through the clouds for maximum effect. It is truly a sight not to be missed. Your idea of what “color” is will be redefined. This species of Eucalyptus is so popular worldwide that many people decide they want to get one and try to grow it at home. Obviously, not everyone lives in the tropics and there arecertain growth requirements that need to be met. The no-frost climate and plenty of rainfall are non-negotiable and desperately needed to make growing this show stopper a breeze. So, unless you’re in the Southern regions of CA, TX or FL on this side of the planet you’re going to have to pass. And, (if you still don’t believe me) another thing to keep in mind is that it grows about 3 feet a year, so unless you’re building a tropical greenhouse 13 stories high, it won’t be long before it outgrows the living room. Interestingly, it will grow up to 125 feet in the HI, CA, TX, FL regions, however, in the regions of it’s origin, mentioned above, it will grow to 250 feet – double the height found in the US! Indeed, there may not be a more dashing spot for that perfect panoramic photo of the Northeast coastline and Keanae Peninsula, so be sure to click away! Located conveniently between Mile Markers 12 & 13, Kaumahina Wayside is a good stop to refresh, and while looking out over Hana’s coastline you might just be instantly transported back to the days of old. It was a scenic hot spot – and still is considered one of the best overlooks on the Eastern coast. Fortunately these days we’re not too worried about being invaded by sea. Back when fleets of canoes, sometimes to trade and sometimes to make war, would approach from the Big Island, the location of Kaumahina Wayside was a critical lookout point to determine whether their intentions were for prosperity or combat. Ever wonder how the Pacific Tsunami Warning Center came into creation? Well… it was April Fool’s Day 1946 when an enormous 8.6 earthquake (whose epicenter was in the Aleutian Islands of Alaska) caused a killer tsunami to hit the Hawaiian islands. Initially, the wave height at the epicenter in the Aleutians was more than 100 feet, but after traveling 500+ mph it arrived in Hawaii just under 5 hours later. tidal wave of approximately 35 feet in height hit from Honokohau to Hana, (pretty much the entire north coast of Maui), without warning and swept away twenty four villagers, many of them children. There were smaller, less destructive waves that followed immediately after the first. Still standing is “Thi’hio Iehowa o na Kaua”, or the old stone church. It was one of the many buildings that survived the tidal wave. Today it is an authentic reminder of the tragedy. The warning system provides hope of preventing it from ever happening again. These unnecessary deaths have been the reason tsunami warning technology was implemented so that people could get to higher ground should a dangerous tsunami approach. Where is Keanae located? After passing the Ke’anae Arboretum there will be a road that goes off to the left just past Mile Marker #16 which leads down to the traditional village of Ke’anae. Today, the people of Ke’anae still live a very simple Hawaiian lifestyle and are known today, as they were in ancient times, for their superb taro and other agricultural production. There are many fascinations to be pondered at Ke’anae. It’s the movie-worthy, charcoal-black, jagged lava rocks which keep the ocean at bay while providing an intense backdrop for the North Shore’s colossal waves. It’s nature’s “photographic opium” hat attracts shutterbugs from around the globe on a regular basis – both on land and sea. As amazing as it looks, this is NO place for SWIMMING or WATER SPORTS of any kind, other than fishing from a safe distance off shore. The North Shore’s big, unpredictable wave action, in addition to the incredibly sharp, almost serrated edges of the rocks at the shoreline make any sort of water activity a “no-go”. Getting shredded to bits is no way to enjoy that Maui vacation of a lifetime so even if a sign isn’t posted, DO NOT SWIM HERE! Only about 53 grueling miles from Kahului, Wai’anapanapa State Park is a remote, peaceful cornucopia of tropical delight. On 122+ acres in Hana, it is a lush, accessible yet ruggedly beautiful and peaceful area. It’s so stunning it attracts adventurers from all over the globe. Whether it’s hiking, camping, fishing, lounging in a cabin by the sea or just laying on one of Maui’s finest black sand beaches, this little gem has it all! And it’s a photographer’s dream… and it should be. Why wouldn’t a photographer go gaga with such unparalleled natural beauty like blow holes, sea stacks, legendary caves, stone arches, an indigenous Hala Forest and that’s in addition to the black sand beach! There are also remains of an ancient man made structure that will attract your attention the traditional heiau (religious temple). Obviously, the rare and always mysterious looking Black Sand Beach is a main attraction and it should be. The Black Sand Beach at Wai’anapanapa is one of the darkest black sand beaches in the world. Charcoal in color when it’s dry and pitch black when wet, it makes for a wonderful contrast against the exotic colors of the lush jungle. It is a favorite among visitors and locals alike. Oh, and don’t forget the sturdy, closed-toed shoes . Shredded feet are no fun on vacation! Good shoes are a must on the rugged Hawaiian Coastal Trail (leads to Hana). Amazing habitats like seabird colonies and anchialine pools can be observed as well in this amazing park. And, how interesting is it that over half of the world’s anchialine pools are found in Hawaii? These brackish water pools are home to some unique species of sea life and are studied by divers because of their unusual appearances. Hawaii is known for it’s famous red shrimp or “s famous red shrimp or ‘opae’ ula. The pools are brackish and their water content and levels change with the tides. This is due to underground tunnels through which the saltwater travels up and mixes with the fresh water pools. Many have dubbed it “Maui’s most amazing waterfall”! At 80+ feet and right at the roadside, it’s an amazing sight to see. And, as if this wasn’t enough, it has a plunge pool below. If luck is on your side, there will be vendors there selling their wares. Every so often there is banana bread sold here. If it’s available and you’re a fan, definitely get some. You’ll be glad you did! Maui, and all of Hawaii, is known for particularly tasty banana bread. If bananas are a favorite, go ahead, blow the diet, or better yet, just don’t have that extra libation with the umbrella in it you usually have that day while on vacation… this is a special treat and it’s worth a little caloric sacrifice! The Wailua Falls are another favorite of photographers, but it’s name can be misleading. “Wailua” falls isn’t in Wailua Valley. It also isn’t fed by Wailua Stream. It’s on the East side of the island, out past Hana on the way to O’heo Gulch and it’s fed by Honolewa stream! And, if going to Kauai, don’t miss the Wailua Falls on the Garden Isle as well. ** Note: Please, exercise extreme caution whenever jumping into unknown depths or pools with rocks below as emergency services can oftentimes take more than an hour to reach injured individuals, if at all depending on the weather conditions. Some areas are difficult to access even with a specially equipped EMT helicopter. Hawaii’s terrain is challenging both on foot and by air as well. If there is a “NO ENTRY“, “NO SWIMMING” or “NO DIVING” sign it’s best to heed the warning and not become a statistic! This is a must see because… well, it’s so understated, peaceful, quaint and it’s such a timeless, beautiful setting that simply stopping here can affect you just the way it did Charles Lindbergh. The world famous aviator could have been buried anywhere in the world but made this his final resting place. 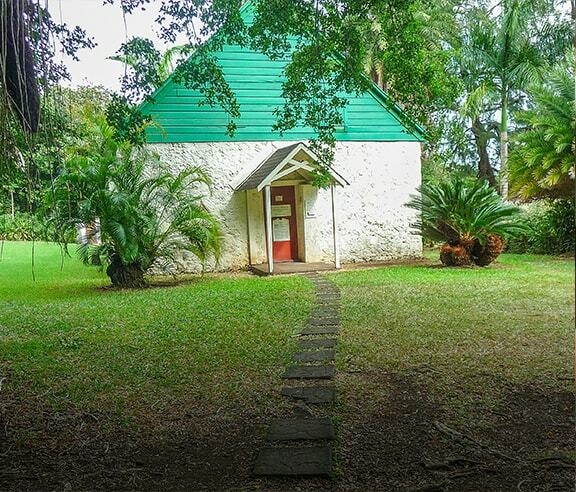 Going there to see the serene church, beautiful trees, curious grave stones and buried animals will connect you to a special time and place when the essence of Hana ruled the land. It takes you back to a simpler time, if only for a brief moment, that we still long to experience. Making it out to this remote place is a very special part of the Hana experience. For most people this is the “turn around spot” where they begin the return journey back to Hana, traveling along the Hana Highway, back past Keanae and finally into Paia and Kahului, but for a select few it’s a much deeper connection. And, FYI, this is the time of day/night when drivers really need to be careful. Most accidents will happen as people get tired or if they start back a bit too late and have to drive part or all of the way at night. It’s a challenging, but beautiful drive home into the sunset (make sure you have sunglasses) or through the pitch dark night. Beware though, the jungle canopy makes it even darker than usual. The danger level increases considerably during these times, but there is some comfort in being able to see car lights before you attempt to go around the previously blind corners. Just take your time. After all, you’re on vacation! The sunset will be extremely intense, so give plenty of space between you and the next car and go slow. The road coming from the opposite direction will seem very different. You will see more waterfalls and other views that you might have missed earlier in the day because of the density of the greenery. Don't be afraid to make the journey to Hana in any way you can. Hitch-hike if you must but for most visitors there are a few ways that are recommended. Take a tour on the road to Hana. You won't be disappointed with a full day Maui tour that includes Hana's backside. Our Maui APP will be available soon on these mobile stores. Learn more about Maui by checking out a Map or getting our upcoming CD. Copyright 2016. I Survived The Road To Hana. Please wait while we complete verification. Don't try to click purchase tour again to avoid possible double booking.